Timing The Coming and Ongoing US Market Crash: American Voters Should Pay Attention To Which Party Is Making or Losing Them Money, Dont Forget Now, Its Your Childrens And Grandchildrens Future, Your Legacy. American Voters Should Pay Attention To Which Party Is Making or Losing Them Money, Dont Forget Now, Its Your Childrens And Grandchildrens Future, Your Legacy. When I woke up this morning I was excited about what subject I will write about today and then I reminded myself. What do Americans care about? There are so many issues to write about, issues that affect the American people to their very core, the destruction of their wealth, job, security, house, dignity, self respect. If their was somebody in your life , in your families life stirring it up so to speak you would waste no time in taking action in pointing this out and correcting that individuals behavior. 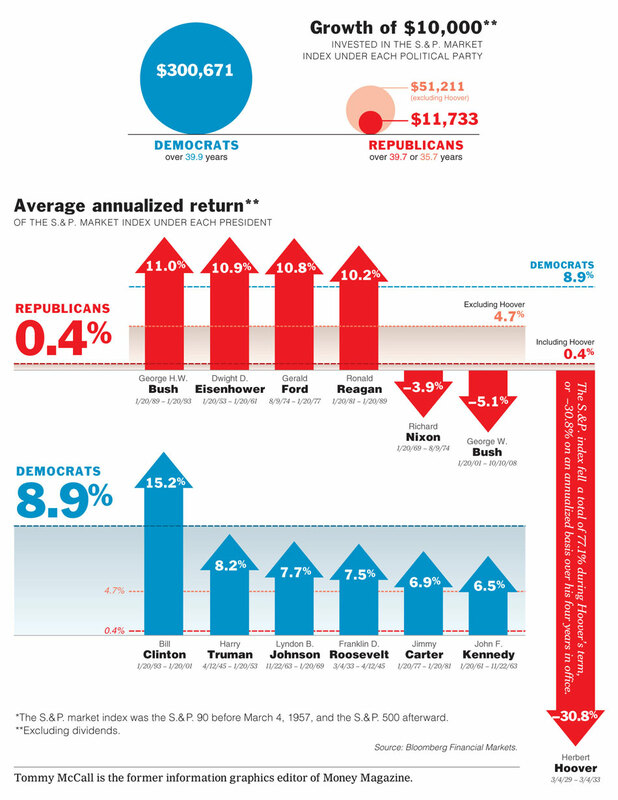 WHICH POLITICAL PARTY MADE OR LOST MONEY IN THE MARKETS SINCE 1929 WHICH FEEDS INTO PENSIONS, RETIREMENT FUNDS(IRA'S), SAVINGS, AMERICA'S FUTURE. THE ANSWER IS AS FOLLOWS. Since 1929, Republicans and Democrats have each controlled the presidency for nearly 40 years. So which party has been better for American pocketbooks and capitalism as a whole? Well, here’s an experiment: imagine that during these years you had to invest exclusively under either Democratic or Republican administrations. How would you have fared? As of Friday, a $10,000 investment in the S.& P. stock market index* would have grown to $11,733 if invested under Republican presidents only, although that would be $51,211 if we exclude Herbert Hoover’s presidency during the Great Depression. Invested under Democratic presidents only, $10,000 would have grown to $300,671 at a compound rate of 8.9 percent over nearly 40 years.